The Goods of the Woods Forest Trail II Rectangular Rug, Model No. 1120, features a lovely forest pattern filled with trees. Sure to add a touch of style to any room, the Goods of the Woods Forest Trail II Rectangular Rug meets the Surface Flammability Test 1631 FF1-70. This gorgeous rug is made from 100 percent Olefin, and is perfect for cabins, dens, and even lodges. The tough, heavy twisted yarn provides a long lasting durability that everyone can appreciate. 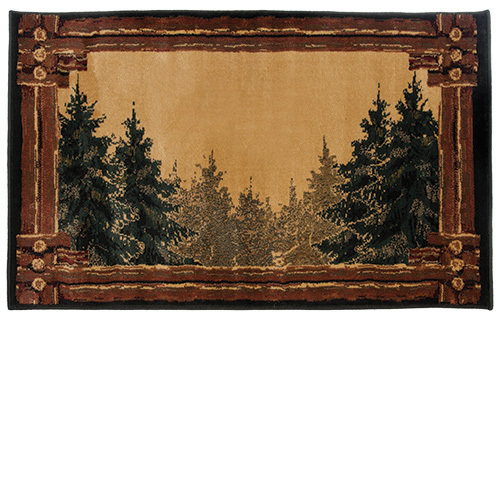 This lovely forest rug measures 30 inches by 50 inches. Is this rug flame resistant? Yes it is flame resistant. The rug meets the Surface Flammability Test 1631 FF1-70. Is the perimeter trim color more brown or burgundy. It is more of a brown. What is the approximate thickness of the rug??? This rug is 7/8" thick. Is there an R-value, K-factor or C-factor for this rug? This rug does not have a specific heat resistance value. What is this rug made out of? Per the manufacturer, this rug is 100% Olefin. This is exactly what I was looking for. Beautiful and a perfect size. Nice rug. Very large. My husband managed to burn it in the first use, yet it saved my wood floor. Well worth the money! It's still rolled up at the edges so I hope in time it will flatten out. perfect for in front of our wood stove. Protects the hardwood floor from embers. Fast delivery. Beautiful and functional rug. VERY HAPPY! This is a very nice fireplace rug. Perfect for our log cabin. This rug is fantastic! The pile is thick and soft. And the rug looks amazing up against our hearth. I�€™m extremely pleased with my purchase! I was pleasantly surprised when the rug arrived. It was exactly as it looked on your website. 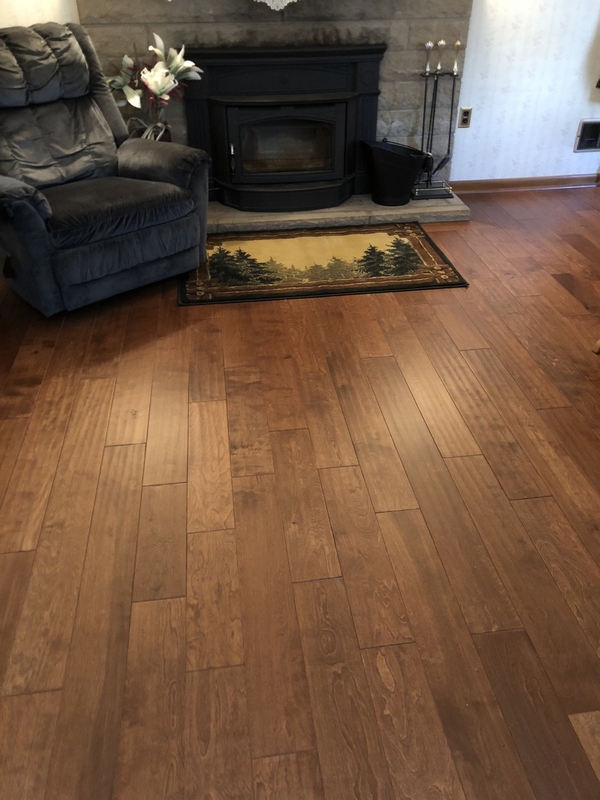 We had new hardwood installed and it really enhances the look of the flooring and fireplace. Great product. Every thing I wanted and more than I expected. Beautiful. I like the colors and I have a log home, so it is a nice rug to compliment the decor. The Goods of the Woods Forest Trail rug arrived soon after I ordered it. It looks beautiful near the cast iron wood stove and brightens the floor area. It is easy to sweep or vacuum. Delivery was quick...rug is nice...wish it was of a little larger size tho to cover more of the carpeting around the fireplace. ConsWish there was a larger selectiion of fireproof rugs. Great looking with a great purpose rug. Not only is this a beautiful rug, it serves a great purpose by help prevent our carpet close to our fireplace from expensive damage if a spark or burning log rolls out of the fireplace. Nice large size with a beautiful outdoor pattern of trees. Looks great on the living room floor. This lovely rug arrived on time and is better than I expected. The colors are beautiful and it is thick and soft. I usually have a small solid color fire retardant rug in front of our stove, but this rug is such a nice upgrade. The quality is A+++. You won't go wrong with this choice. This is a very well made hearth rug at a great price! My wife and I really love it! A search took me directly to your web site. Photo depictions were accurate, ordering easy, and delivery timely. Excellent job! ProsAll aspects of the process. This rug is a little bigger than the one we were using in front of our wood stove so it is protecting the area better. I really like the colors and design. It fits our lakehouse in the woods very well. I am very pleased with this rug. it is exactly as pictured, and arrived within a day or two of my order. Looks beautiful in front of my fireplace. ConsThe only drawback is that the rug slides very easily and does not stay in place. I will have to get a non-skid pad to put under it. After a long search for the perfect hearth rug for our log home I finally found it! It is so beautiful and the quality is excellent. Thank you so much! It's beautiful and well made. Can't wait to put it out for Xmas. Still waiting for colder weather. This rug, is exactly what I was looking for.It has size, to cover the front of my woodburner, and it looks great !! Very pleased with this rug. Excellent quality and fits perfectly in our cabin/home. Catches the fireplace "sparks" as advertised. Will be ordering more. ProsWorks beautifully with our woodsy decore. I love it and the price was right. The rug arrived in excellent shape. I took it out of the box and put it in its place in the living room. My 6 year old son refused to step on it because it was too pretty of a picture to walk on. He still walks around the rug if he is not in a hurry. The rug fits the decor of the room perfectly and we have had many comments on it. ProsExcellent picture, workmanship, and durability. The rug we ordered came on time and was fantastic. It was exactly as we expected and looks great. The kids think it looks so good because it is a picture on the floor. It doesn't burn when hot embers hit it. It is easy to clean. I will get another one when this one get old looks. Great purchase. I purchased the Goods of the Woods Forest Trail rug for my parents as a Christmas gift and they love it! I chose it for its unique print and outdoor theme. The rug is exactly as shown in the picture online and is made of quality materials. It is the perfect accent to their living room. This is an attractive hearth rug suitable for a lodge, french-country, or ranch-style house. It is subtle - not trying too hard to look good, it just does. I dislike hearth rugs that have that plastic-like hard under-surface and curl on the ends, but this rug does not, and therefore it lays nicely. It is large enough to cover spark distance out of the fireplace. I have not yet had a spark land on it, so I can't tell you how fast it burns. I was worried that the tree picture might look dorky, but it doesn't. I recommend this rug. Already been using it a lot and really pulls the room together. Accurate product and accurate shipment arrival. Looks great in the room. Rug fits perfectly in our forest and hunting mounts home. Have not had an occasion to test fire resistance, but I'm sure it will perform as described. I had searched several sites online to find a fireplace mat for our home. I kept going back to the Fireplace Store site and had fun deciding on what mat to buy. I finally made my choice and ordered our mat. Deliver was quite swift and we are really happy with the mat we picked out. It looks great and ads charm to the fireplace. I love my new Fire place rug it looks beautiful and is a great value. I will buy from efireplace store again.